Job #678, built for George S. Morris in 1963. A beautiful Greek Revival design located just north of the Emory campus in a very quiet neighborhood. It is approximately 3,000 square feet and features 5 bedrooms and 3 recently-renovated bathrooms. Interestingly, if you lived in this home and had a high-school age child and wished to reap the benefits of a public education, your child would attend Druid Hills High School, yet another Buck Crook design! You'd also be just around the corner from Peachtree Baptist Church, another Crook creation! 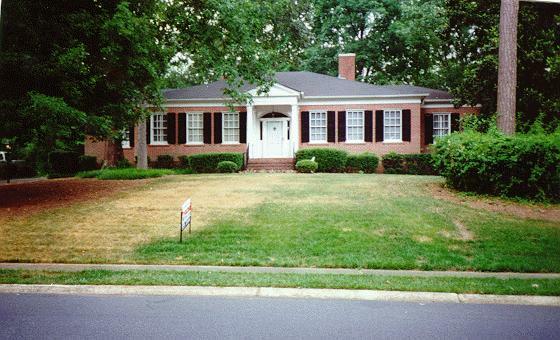 The house was listed by Estelle Goldin with Re/Max in early March, 1996. In December, Wanda & Bob Klodosky and their four-year-old daughter Kasey moved in. They closed in February of 1997. They tell me they are "thrilled with the house" and plan to begin renovations on the kitchen and perhaps extend the upstairs some. I don't know if they are Baptists.